The 5o5 is a beautifully balanced and sweet boat to sail but if it needs to be set up for the conditions to experience it properly. There are a myriad of different ways people lay out the various controls but however you control the rig and sail adjustments you MUST be able to control some key things and you MUST be able to move those controls through a certain range. So the starting point to setting up your boat to enjoy and be fast is to ensure you can achieve this. Here you will find out what the most important measurements are and how to measure them properly. Once you have the right configuration as discussed below, you will be ready to work on actually sailing and the specific setup for boat speed in the different conditions. Select the Tuning option for more. Tuning a 505 and seeing the performance improvements when it is properly tuned is very rewarding but if you cant actually achieve the key measurements you will not be able to tune the boat properly on the water. Take the time to check your boat has the capacity to achieve the ranges detailed in the Boat Configuration Menu. Rake is how far the mast is swept backwards from vertical. As the wind increases you will need to rake the mast progressively more to keep the boat balanced. You can measure rake a number of ways. The most common is by measuring the distance from the top of the mast to the keel band at the stern. 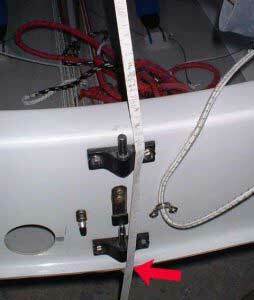 Take the measurement from the underside of the contrasting band at the top of the mast to the keel band as shown. You can generally do this by using the main halliard to pull a tape measure to the top of the mast or putting the rigged boat on its side. The mast must be straight to measure it properly. 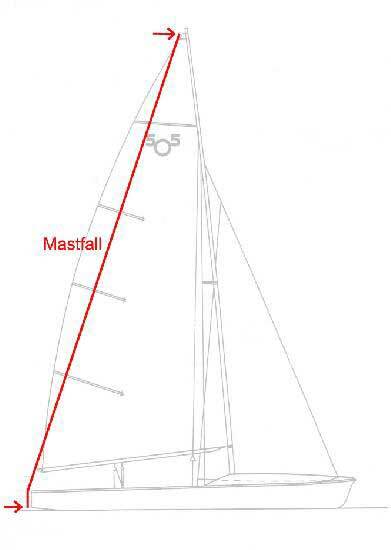 The location fore and aft where the mast is stepped is controlled by the Class rules. “With the mast spar perpendicular to the base line, the after side at deck level shall not be less than 3048mm and not more than 3202mm forward of Station 11 (the transom). Some people step their masts as far aft or close to as far aft as possible. HOWEVER. You generally do not want the aft end of the mast to touch the back of the deck level gate when you rake. If it does so too early in the rake range, the mast will bend around the back of the gate. When the mast bends down low at deck level it tends to become straighter further up the mast which can make your mainsail too full and powerful up high which you don’t want in overpowered conditions. 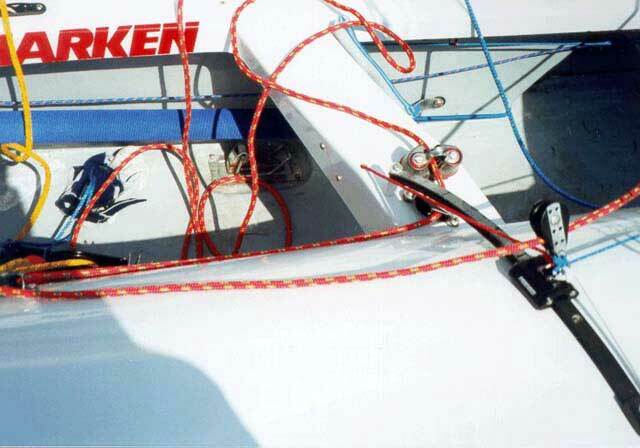 You need a mast ram to control mast bend at deck level. The range of the ram needs to allow you to force prebend into the mast for light conditions by pulling the ram up the track which pulls that part of the mast forward. At the other end the ram needs to be capable of down adjustment until it reaches the back of the mast area. See the Tuning Section for more information on where the ram should be set for different conditions. The spreaders on the mast affect how much and when the mast bends. Particularly the middle of the mast. It is important to have the spreader length and how much they are swept back roughly correct to suit the luff round that is cut into your sail. Most mainstream sailmakers can provide you with the recommended measurements. See the Tuning Grids provided for details. Or ask one of the top sailors using the same make of sail what spreader measurements they use. Is measured is measured from the shroud wire to the sidewall of the mast. Is measured perpendicularly from the back of the mast track to a straight line between the spreader tips (where the shroud wire is fixed). If there is play in the spreader bracket pull the spreaders back to where they will be when the shrouds are loaded during sailing. 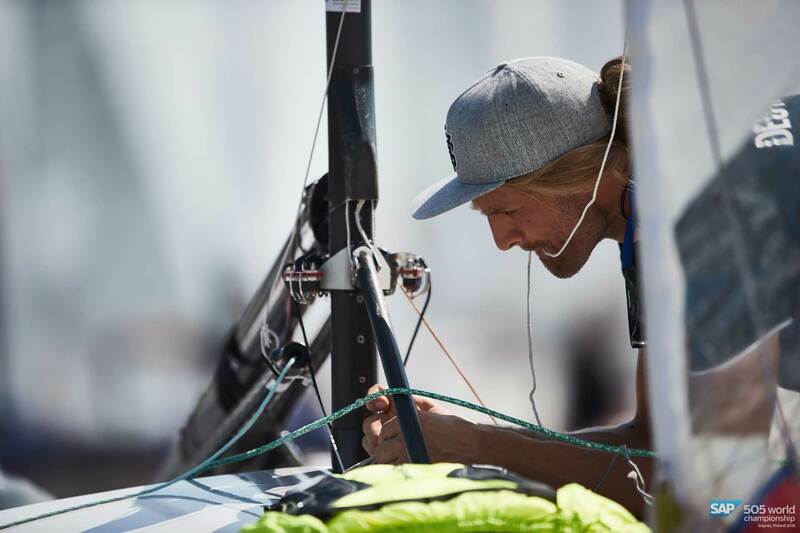 You need to ensure your boat can sheet the jib correctly for the full range of conditions. 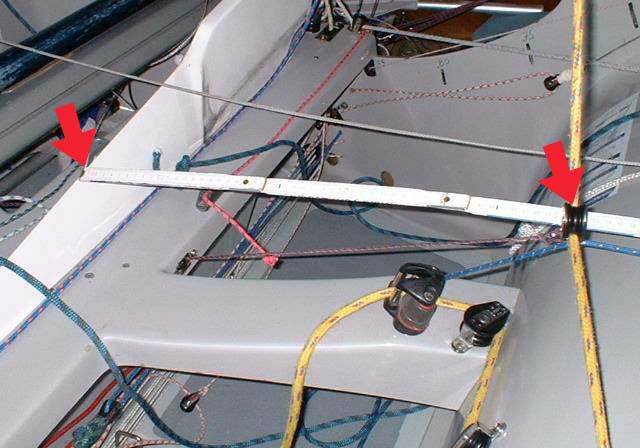 That is you will need to be able to adjust the jib sheet lead both inboard/outboard and fore/aft. This is generally done with a barber hauler system which moves the first block that the jib sheet is fed through. From 45mm out to around 75mm. from a forward position of ?? back to an aft most position of ?? There are many different ways to achieve these measurements. However your boat is rigged if you don’t have the ability to move the jib sheeting position through the above range you may struggle to set up the boat properly in certain conditions. This short video shows a jib sheeting position being moved outboard. This video shows the jib sheeting position being moved aft.